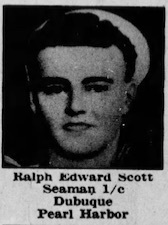 Ralph Edward Scott was born June 11, 1922 to Clifford and Lillian Marie Bartholomew Scott. He died Dec. 7, 1941 and is memorialized at the National Memorial Cemetery of the Pacific, Honolulu, Hawaii and has a cenotaph in Fort Logan National Cemetery, Denver, CO. Petty Officer Scott served in World War II with the U.S. Navy aboard the USS Utah (AG-16) and was MIA/FOD/KIA in the Japanese attack on Pearl Harbor. He was awarded the Purple Heart.